Samuel Rank Ernst was born on 1 April 1867 in Wilmot Township, Waterloo County, Canada West (later Ontario). John Ernst and Sophia Rank appeared in the 2 April 1871 first national census of Canada in Wilmot, Waterloo South, Ontario, Canada. Other members of the household included Samuel Rank Ernst, Catherine Ernst, Louis Ernst and John R. Ernst. John Ernst and Sophia Rank appeared in the 4 April 1881 census of Canada in Wilmot, Ontario, Canada, enumerated near the household of John's brother Jacob Ernst.. Other members of the household included Samuel Rank Ernst, John R. Ernst, Catherine Ernst and Lovina Ernst. John P. Rank and Samuel Rank Ernst appeared in the 1888 Minneapolis, Minnesota, City Directory at 501 4th Avenue NE listed as Rank & Ernst (John Rank Jr and Samuel Ernst), grocers.. He married Fredericka Dorothea Augusta Vorwerk, daughter of Ludwig Wilhelm Philipp Franz Vorwerk and Johanna Faber, on 8 May 1889 in Minneapolis, Hennepin County, Minnesota, by license issued the same, with Kingsley F. Norris, MG, officiating. The marriage was witnessed by Louis Vorwerk and Edwin A. Cadwell. He was employed as a clerk in a store, according to the 1891 census. He was a merchant, according to the 1901 census. He was self-employed as a drygoods merchant, according to the 1911 census. The following appeared on 23 June 1938 in the Gospel Herald: Louis Ernst passed away suddenly at the Kitchener and Waterloo Hospital, late on Friday afternoon, May 27, 1938; aged 78 y. 1 m. 16 d. He had been about in his usual health until a few hours previous to his sudden and unexpected death. The deceased was a son of the late Mr. and Mrs. John Ernst and was born in Wilmot Twp., a few miles north of Baden on April 11, 1860. After his marriage to Lydia Rickert who predeceased him 20 years ago, he farmed for many years near Kitchener, retiring from active farming about 20 years ago. He has resided in this city for the past 45 years. He was a life-long member of the Mennonite Church, and interested in her welfare. He is survived by his second wife, 2 daughters (Mrs. George Uhrig and Miss Lillie Ernst both of Kitchener), 3 sons (Ephraim and Milton of Kitchener and Alton of Preston), 1 brother (Samuel Ernst of Kitchener), 2 sisters (Mrs. William Reamer of Drayton, and Mrs. William Martin of Millbank), 20 grandchildren, and 1 great-grandchild. The services were conducted by Bros. C.F. Derstine, and O. Burkholder. Themes, "The Living Hope," and "Exaltation by God." Sam Ernst was caught in a shapshot hefting a pumpkin. Fredericka Dorothea Augusta Vorwerk became a widow at his death. 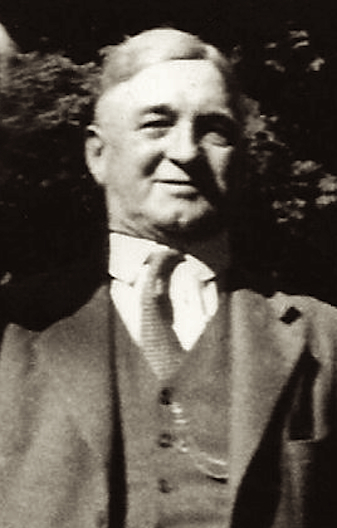 Samuel Rank Ernst died in 1943. He was interred at Protestant Mausoleum 24-B, Woodland Cemetery, Kitchener, Waterloo County, Ontario, Canada.